The Vijayanagar empire emerged in fourteenth century India and lasted a fairly remarkable three hundred years. It was a formidable Hindu kingdom which ruled Andhra, Karnataka, Tamil Nadu, and parts of Kerala in southern India. It also governed the territories of Mysore, Trichinopally, Kanara, Pondicherry, Chingalpet and Kanchivaram. To its south was the Hindu Zamorin of Kerala, while to the north was the Bahamani sultanate of the Deccan. The empire's now-ruined capital city of Vijayanagara can be found in the Bellary District of northern Karnataka. Two brothers, Harihara (Hakka) I and Bukka Raya, laid the foundations of the Vijaynagar capital and of the empire. 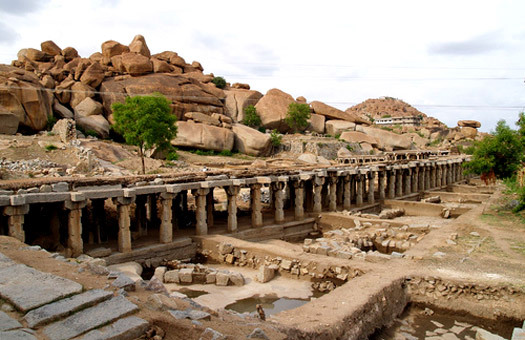 Vijayanagara was on the south bank of the River Tungabhadra near the fortress of Anegudi. Also known as the Sangama brothers, these two adventurers consolidated their power and then expanded it, first under Harihara I and then Bukka Raya, which made the capital more defensible and secure. It is said that a sage named Madhav Vidyaranya and his brother Sayana were the inspirational source for this empire, and its rulers were strict worshipers of the Hindu gods, but also tolerant towards the other religions. Harihara I and Bukka established the Vijaynagar kingdom when the Tughlaqs of Delhi lost power in the Deccan, at the same time as a patchwork of minor kingdoms emerged around it. The emperors of the Sangama dynasty were great patrons of art and culture, and under them the region influenced development in music, literature and architecture. Many temples were built in their southern Indian territories and the economy of the region flourished, with several coins being introduced during the empire's existence. Harihara was the eldest son of Bhavana Sangama, who belonged to the Kuruba (or Kurumas, Dhangaras in the southern Indian states). Some scholars prefer the idea that he was from the Yadava clan. It has been concluded from inscriptions that Harihara is administering the northern parts of Karnataka at Gutti, in Ananthpur district, in 1339, which is the northern section of the Hoysala kingdom. Upon the death of Hoysala Veera Ballala III, Harihara takes full control of the entirety of the kingdom's territory. Brother. Co-founder of the empire. The kingdom prospers and continues to expand under Bukka Raya, as he conquers most of the kingdoms of southern India. He defeats the Shambuvaraya kingdom of Arcot and the Reddis of Kondavidu by 1360 and the region around Penukonda is annexed. 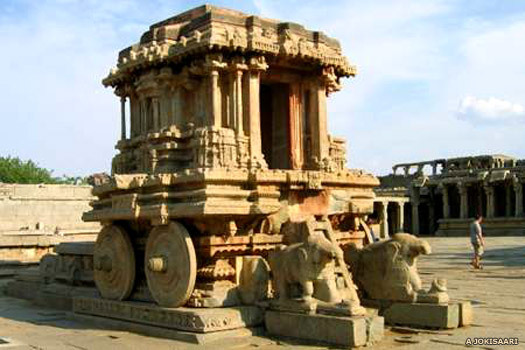 He also moves the capital of the empire to Vijayanagara (now more popularly known as Hampi), on the south side of the river, which is more secure and defensible than the previous capitol at Anegondi. Bukka Raya defeats the sultanate of Madurai and extends his territory into the south, reaching all the way to Rameswaram. By this point, Bukka Raya has gained the upper hand over the Bahamanis for control of the Tungabhadra-Krishna doab. He also takes control of Goa and the kingdom of Orya and forces the Jaffna kingdom of Ceylon and Malabar to pay tribute to him. Continued to expand the empire. Harihara's death leads to a fight for the throne by his sons: Deva Raya I, Bukka Raya II, and Virupaksha Raya. Virupaksha Raya rules for just a few months before being murdered by his sons and then succeeded by Bukka Raya II. He then rules for just two years before being succeeded by Deva Raya I. Virupaksha's poor reign is marked by the loss of a lot of the kingdom's territory to the Mohammedans, locations such as Goa, Chaul, and Dabhol. Son. Ruled for a few months. Murdered by his sons. Brother. Overthrown by Deva Raya I.
Deva Raya's reign is marked by continual attacks by the Velamas of Telangana, the Bahamani sultan, the Reddis of Kondavidu, and the Gajapatis of Orya. Unlike his father, Deva Raya II is a forceful and powerful ruler. He defeats the Gajapatis of Orya three times in 1427, 1436 and 1441. Deva Raya succeeds in conquering Kondavidu in 1432, and repels invasions by Ahmad Shah I of the Bahamanis while holding Mudgal fort in 1436. He later restores the Reddis in Kondavidu. Son. Generally weak and corrupt. Deposed. The Bahamani kingdom has taken over much of the Vijayanagar empire by this point. The Portuguese have also recently arrived in southern India, seizing many of the ports on the western coast that the Vijayanagar empire has until recently controlled. The Gajapatis conquer Rajamahendri in 1454, and Udayagiri and Chandragiri in 1463. Nephew and usurper. Murdered by his son. Virupaksha Raya seizes the throne from his failed cousin, but faced by constantly rebellious nobles and officials he is unable to halt the decline of the dynasty. He loses the Konkan coast (including Goa, Chaul, and Dabul) by 1470 to Mahamud Gawan, the prime minister of the Bahamani kingdom, when he is sent to conquer the area by Sultan Mohammed Shah III. Virupaksha Raya is defeated by Purshottam Deva of Orissa, at Kanchipuram, which is under Vijaynagar control. The victorious Oryan king marries Virupaksha Raya's daughter, Padmavati. Son. Fled in the face of a coup. Despite his attempt to secure control of the empire after murdering his father, Praudha Raya fails to halt its decline. Seeing that the only way to save the empire is to mount a military coup, the king's general, Saluva Narasimha Deva Raya, takes control, founding the Saluva dynasty. After murdering his father in 1485, Praudharaya himself was not able to rebuild the kingdom, but fortunately an able general in Saluva Narasimha came forward to take control and help to prevent its demise. This change of power marked the end of the Sangama dynasty and the beginning of the Saluva dynasty. By tradition the Saluvas were natives of the Kalyani region of northern Karnataka. The Gorantla inscription traces their origins to this region from the time of the Western Chalukyas and Kalachuris of Karnataka. The term 'Saluva' is known to lexicographers as 'hawk'. They later spread onto the east coast of modern Andhra Pradesh, perhaps by migration or during the Vijayanagar conquests of the fourteenth century. The earliest known Saluva from inscriptional evidence in the Vijayanagar era was Mangaldeva, the great-grandfather of Saluva Narasimha Deva Raya. Mangaldeva played an important role in the victories of Vijaynagar king, Bukka Raya I, against the sultanate of Madurai. Former general. Founder of the dynasty. Despite taking firm hold of the reigns of power, Saluva Narasimha faces continual rebellions and uprisings, and between 1489-1491 he loses Udayagiri to the Gajapatis, while the chiefs of Ummattur in the Mysore region, the Saluvas of Hadavalli and the Santharas of Karkala from the coastal Karnataka region, Srirangapatna and the Sambetas of Peranipadu in Cuddapah still remained threats to the empire. Saluva Narasimha's death in 1491 leaves his underage sons as his successors, so a trusted general and minister, Narasa Nayaka, of the Tuluva family, is appointed regent. Almost immediately, Thimma Bhupala is murdered by an army commander during a period of political unrest in the empire. Narasimha Raya, also known as Immadi Narasimha or Dhamma Tammaraya, has spent the entirety of his 'reign' in confinement at Penukonda, while Tuluva Narasa Nayaka holds true power. On the general's death, his son takes over as regent, and has to face several rebellions by regional lords who think their time for independence has come. When Narasimha Raya is murdered at Penukonda, Viranarasimha Raya is able to proclaim himself king in name as well as fact, founding the Tuluva dynasty. The dynasty was effectively founded when General Tuluva Narasa Nayaka became regent to the two young sons of the previous emperor in 1491. The sons were kept under firm control, with the younger of them even being kept in confinement for his entire reign, before he was murdered. That murder allowed the general's son, Viranarasimha Raya, to declare himself king, although he spent his entire reign putting down rebellions throughout the empire. The Tuluva gained their name from their homeland, the Tulu-speaking region of 'Tulunud'. Narasa Nayaka belonged to the Bunt community, the upper class matrilineal Hindu community belonging to the Nagavanshi Kshatriya, a warrior order found mainly in southern coastal Karnataka. Under their control, the Vijaynagar empire reached the height of its power. The halcyon days of empire under Krishna Deva Raya have faded under his successor. Feudatories and enemies make Achyuta Deva Raya's reign a difficult one. In addition, Achyuta Raya has to contend with the powerful Aliya Rama Raya, who is competing with him for the throne. Upon the king's death, the succession is disputed between his son and the now all-powerful Aliya Rama Raya. Son. Ruled for six months. Cousin. A minor and puppet in the hands of Aliya Rama Raya. Son-in-law of Krishna Deva Raya and regent. Quli Qutb-ul-Mulk of Golconda is defeated by Timmarusu, the king's minister, and is subsequently assassinated by his own son. The Vijayanagar empire is defeated at the Battle of Talikota by an alliance of Deccan sultanates; Ahmednagar, Berar, Bidar, Bijapur, Golconda. The sultan of Bijapur takes the Raichur Doab as his prize. The empire's authority is terminally weakened by this defeat, especially thanks to the death in battle of its powerful, if uncrowned, ruler, Aliya Rama Raya. Faced with total defeat, his brother empties the royal treasury and flees towards Penukonda, along with the crown prince. Shortly afterwards, the Nayakas of Madurai and Gingee assume a level of independence, although they still recognise the Vijaynagar emperor as their master. Brother of Aliya Rama Raya and regent. Tirumala faces a renewed attack by the sultan of Bijapur, but this time is victorious, even to the extent that he regains some territory. At some point afterwards, he also tactfully approves the new status of the southern Nayaks, although Madurai and Gingee only grudgingly agree. The rulers of Tanjore and Mysore still pay their own annual tribute. The death of Sadashiva Raya allows Tirumala to proclaim his own dynasty, the Aravidu. This was the fourth and last Hindu dynasty which ruled over the Vijaynagar empire in southern India. Aliya Rama Raya had been the regent for the Tuluva dynasty's last king, but following the destruction of the empire in 1565, his brother, Tirumala, had to rebuild it from a new base at Penukonda. He was soon able to declare the foundation of his own dynasty, the Aravidu. Unfortunately, the empire would never again be the power it had once been. Former regent. 'Reviver of the Decadent Karnataka Empire'. Tirumala splits his territory between his three sons: Sriranga I in Penukonda in charge of Telugu country, Rama in Sritrangapatna in charge of Kannada country, and Venkatapathi (later to be Venkata II) in Chandragiri in charge of Tamil country. Penukonda is the capital of the reborn empire. The king abdicates in 1572 after feeling himself to be too old to rule, and retires to pursue a religious life until his death in 1578. Son. Governor of Telugu at Penukonda. King in 1572. Brother. Governor of Kannada at Sritrangapatna. Brother. Governor of Tamil at Chandragiri. King in 1586. Sriranga does much to restore the empire, but he also suffers continual attacks by his Muslim neighbours, especially by the sultan of Bijapur, and some loss of territory is suffered. he dies without an heir, and is succeeded by his youngest brother, who oversees a more secure and prosperous reign from his new capital at Chandragiri. Son of Rama. Venkata's heir but rejected by the nobles at court. Sriranga II and his family are gruesomely murdered by rival factions at court, headed by Jagga Raya, a relative of the royal line. The king's son, Ramadeva, is smuggled out of prison by Yachamanedu, a faithful commander and viceroy under the reign of Venkata II. After a bloody three-year war, Ramadeva ascends the throne in 1617. Grandson of Aliya Rama Raya. After years of attacks and being repulsed, the Vijaynagar empire is finally conquered by the sultanates of Bijapur and Golconda. Many of the empire's largest vassal states immediately declare independence, so the territorial gains made by the sultanates are limited. Those vassals, Mysore, Keladi Nayaka, and the Nayaks and Nayakas of Chitradurga, Gingee, Madurai, and Tanjore, all become powerful states in southern India.